MVC is a frequently used paradigm for almost all modern desktop architecture design including Microsoft Windows operating system. Traditionally, desktop applications employ MVC paradigm in method-based interactions between the components to achieve high performance for interactive applications. Publish/Subscribe scheme enables event-based programming to link event source component and event listeners' components asynchronously through callback methods while event messages are hidden at system level. This approach is widely used in object-oriented systems including Java AWT, Swing, and applications built on top of them such as Batik SVG browser. We propose a different approach of "explicit message-based MVC" paradigm for applications deployment, which replaces hidden method-based events at Java run-time level by exposed messages. By doing so, the tightly coupled connections between different parts of an application are replaced by a loosely coupled messaging linkage service model with flexibility, distribution, and scaling advantages. Can MVC be implemented in a message-based fashion? What is the performance of the message-based MVC and what factors influence it? How does it depend on the operating system, the application, machines and network? What is the relationship of collaboration and Web services with MVC paradigm? How easy is it to covert an existing application to message-based MVC? What are the architectural and implementation principles to be used in building applications from scratch in a message-based MVC paradigm? We have a complete analysis of constituent components and their interactive relationship for the Batik SVG browser. The logistic components can be decomposed into a three-stage pipeline, as illustrated in fig. 1. Theoretically, any parts with natural event linkage between client user interface and computation core can produce web services coordinated in a single application. We performed substantial experimentations to find the best decomposition point, which preserved system functionalities while avoiding excessive re-engineering of the software. We chose to split the SVG browser between the DOM and GVT tree, which allows generalization to other DOM applications. We have designed a series of performance measurements to test the viability of our approach. There are many variables including position of Model, View, and Event Broker (NaradaBrokering) and the choice of type of host computer and network connection. One can also vary the application running in the Model Web service. One can investigate either the single Model and View or the collaborative models. Early results show the main issues to be the algorithmic effect of breaking the code into two, the network and broker overhead, and thread scheduling intervenes of operating system between interfaces of SVG application and messaging brokers. Our initial tests show the client to server and back transit time is only 20% of the total processing time in the scenarios where the message broker is local. We've presented a uniform architecture with message-based MVC service model which unifies desktop and Web applications. Other research is undergoing in our laboratory in extension of these ideas to other presentation style applications including OpenOffice and PowerPoint using vendor APIs. 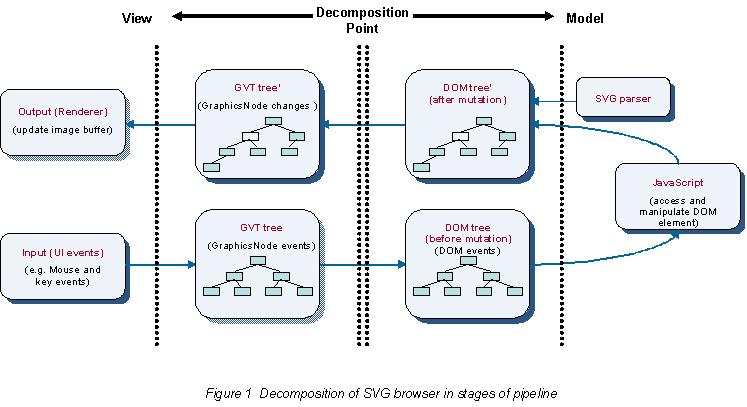 In our final paper, we will provide detailed performance optimization and analysis for the SVG Web Service application.